This year, 16 teams amongst the best ones over the world competed in Germany, in the LanXess Arena of Cologne. On the players’ shirt, we could enumerate 60 brands printed as sponsors. The event counted 9 official partners. As well as last year, some companies like HyperX, Intel or PaysafeCard were sponsoring teams while also partnering the event. In total, there were 64 brands to be visible during the event broadcasting. When methodically examining the VODs, we noticed that, for its 2016 version, the contest lasted 3.122 minutes, so around 52 hours, which is 10 hours more than last year! The ESL One of Cologne is a contest with a huge production and the show wiring on stage is meticulous. About 32% of the air time (editor’s note: 16 hours) of the broadcasting were dedicated to the show. Those are the famous desk analysis times, players’ interviews or match overview. Over the whole tournament, the audience was able to enjoy about 35 hours of matches. The remaining time count is dedicated to breaks at the match half-time or for the sportscasters to breath. Teams Sponsoring – Who’s the winner? 2015 vs. 2016 – Which development? What are the effects on a brand? HyperX is the big winner of the ESL One Cologne. 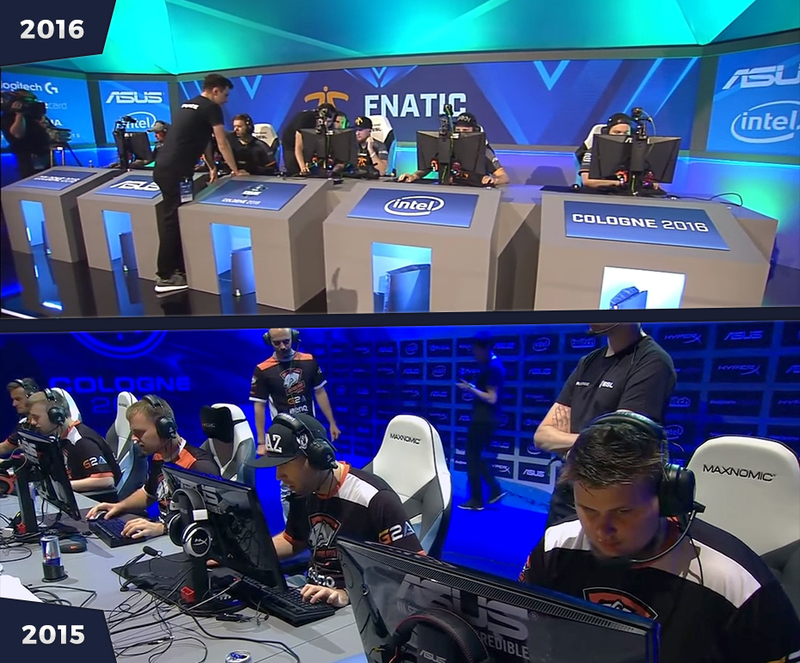 By sponsoring the two finalists, SK Gaming & Team Liquid, Kingston Technology’s firm, gained the best air time, a strong brand image and one of the best audiences with an average of 320.118 spectators during its teams’ matches. Visible on air during around 14% of the broadcasting time, Twitch only comes second of our ranking. With its logo printed on 6 teams’ shirts, the broadcaster has the best air time but its audience average is contrasted by the lukewarm result of a team who went off prematurely, like Counter Logic Gaming. The other outstanding fact is the very good score of brands sponsored by Team Liquid. The team not only comes second at the ranking but also achieves a heroic journey. It had to play 11 cards before failing at the finals against SK Gaming and most of its matches were well done! An enabling exposure time which benefits to the brands who bet on Team Liquid. In which concerns the official partners of the event, nothing or almost nothing has changed. They are the most visible brands on your screen. Asus and Intel, as “gold” partners, took advantage of the best exposure. Hardly impossible no to see them on a camera shot! For Logitech, Paysafecard, Nvidia and TheScore Esport, they share an exposure on a rolling basis over the whole duration of the event. They are displayed per pairs and therefore are visible during half of the event. For HyperX and Need For Seat, as “supplier” partners, they are thus a little less visible. Those brands offset with product placement during the course of the event and by taking part to the ESL “give-away”. We will return to this later on. The show organised by the ESL has significantly evolved over the year. When compared to the last version, the stagecraft was reviewed and the broadcasting was spread over more than 52 hours, which is 10 hours more than last year! We also note an increasing number of brands involved. In 2015, we counted 50 sponsors against 64 in 2016. An increase of 28% which shows that more and more companies are interested in the electronic competition. We also wanted to compare the measured results between 2015 and 2016. As we changed our calculation method in the meantime, we compared the brands’ exposure time based on a factual ranking. The first thing we notice is that our 2016 top 20 has seen a 28% growth of its potential exposure time. Despite this significant growth, we don’t feel like an excessive branding. First, the contest is more spread out, so the brands display is too. But it’s now obvious that the organization has understood that it’s not worth to have so many products placements. In which concerns the teams, we notice an average growth of 19.000 new followers who subscribed to the teams’ social media. A special mention for Optic Gaming: in spite of a poor performance, the famous Call of Duty team was taking part into its first major and we can point out the effect as 70 597 new followers subscribed to the team’s network. Regarding the event partners, we were more interested in the accounts of the brands involved in the give-away organized by the ESL. By suggesting the followers to directly subscribe to the brands partnering the event, these companies benefited from an average increase of 58.000 new followers over the 5 days of the event. SmartCast’s eye: This 2016 version is an important milestone towards brands visibility. It’s clear that the ESL reviewed the way to bring them forward. These brands are not only longer visible but they also benefit from a more ergonomic and aesthetic exposure. And regarding the recipe to gain a better brand image, this doesn’t change. We need to rely on the teams which have the best chances to stand in the semi-final line-up. This study also allows us to see that the ecosystem of those companies who invest in esport remains faithful and goes on supporting the teams. This is an important focus that highlights some degree of reassuring stability for the future. Finally, we can see that the video games contest is an industry which still and more and more attracts, especially when it comes to Counter Strike. This year again, new brands entered the contest. But until when? Even if the ESL One of Cologne was announced to be the major tournament of the year, with a one million dollars of cash prize and a better production, the first evidences show that the audience decreased. Several reasons can explain this: UEFA Euro final, competition from other games or overdose of contests? Probably a mix of all three. It’s too early yet to draw conclusions, but it would be the first time for several years that audiences of a major contest would experience a decrease. The formula for the organisation of a perfect contest was not found yet, and with plenty of stakeholders who embarked in this adventure, no doubt that it would cost too much for some of them.